It’s a really important geography skill that pupils can orient themselves according to the compass in the classroom. 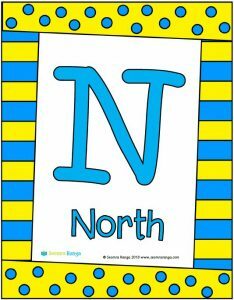 This simple FREE resource consists of the main compass points of N, S, E, W as well as the secondary compass points of NW, NE, SW and SE. Find out your classroom orientation and display these posters on the appropriate walls and corners of the room. If you feel that the posters are too large for your classroom, simply go into your printer preferences and adjust the setting to print two sheets per page.